Valencia, September 22, 2018 – Grand finale for Luna Rossa in Valencia. The team, thanks to an incredible come back in the final race of the week, maintains its lead at the top of the ranking and wins the event. After five months of extremely competitive racing in the most beautiful courses of the Mediterranean and Atlantic, the 52 super series circuit comes to an end in the city of Valencia. This town is an iconic location for Luna Rossa, having hosted the team’s highly competitive challenge for the 32nd America’s Cup in 2007, an event in which many of the sailors on the current team - among whom Vasco Vascotto, James Spithill, Max Sirena and Shannon Falcone - had already competed against each other in the Cup matches. 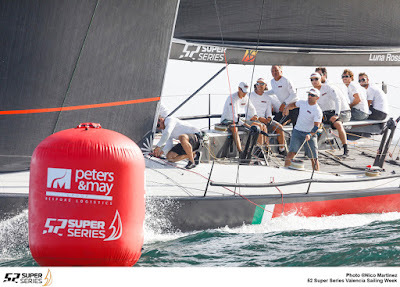 The fleet of eleven TP 52 boats fought hard to win the last event of the 52 Super Series along the shore of the famous Malvarrosa Beach, the top spots of the podium being open until the very end. The regattas provided excitement and many lead changes in the fleet, with an exciting comeback during the penultimate day that allowed Luna Rossa to close the day at the top of the ranking in view of the final race. The light and unstable winds caused several postponements and cancelation of several races and put to test the nerves of the crews. Anticipation ran high on the final and decisive race day but the verdict was irrevocable: not enough wind to start the last race, therefore Luna Rossa closed the event in first place. The challenge to win the Valencia final was not easy in a fleet of seasoned teams with strong crews, all of which were well-prepared and ready to fight. Luna Rossa closes the season with a fourth place in the overall ranking, at few points from the winner, in a circuit that has proved to be an excellent training ground for the team, thus proving that nothing can be taken for granted in these regattas in which the smallest uncertainty can cost positions in the ranking. Max Sirena, Team Director and skipper, commented the last day of racing: "The TP52 Season has come to an end and we reached the goal that we had set for our team, which was to win this event. Today we would have been happy to race again to try and move up in the overall ranking as well but unfortunately the wind didn’t allow us to do this. However, we are still very happy with this result”. He adds: “The level of this circuit is very high, and it has been a good test to assess the set-up of our group in view of our preparation for the America’s Cup in the coming three years. Our journey started with the 52 Super Series and is meant to lead us towards the highest levels of achievement. The standards of excellence in this circuit have given us additional insight in what we can do to improve and optimize our team; it has also been an excellent test to improve our strategies and set-up on board”. Vasco Vascotto, Luna Rossa tactician: “I want to congratulate the whole team for this event, for having overcome the difficulties that we faced during the last day in Portals. It was important for us to prove that we can be competitive. So this event has been great and helped our team, that is in many aspects very green, to grow. We are pleased to have overcome the several moments of pressure during the last events; we are clearly disappointed for the loss of points during the season, but we choose to see the glass half-full and want to enjoy this win”. Francesco Mongelli, navigator: “It was important for us to close this event well; it has been a season of challenges, in which we got to know each other and to create a closely knit group between sailors and shore team. Now we need to work hard, together, towards an even bigger goal, although the TP52 is a class of ultimate excellence”. The team is already working to move back to its operations base in Cagliari where it will continue to prepare for its next important goal: the 36th edition of the America’s Cup.